Hamilton must have about 30 or more models named Sea-something. So many, in fact, that they took to adding roman numerals to mark new models. A good example is the 1965 Sea Mate II. It's a completely different model than the 1959 Sea-Mate issued a few years earlier. 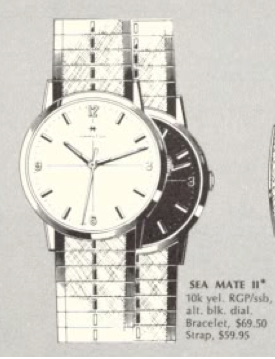 The Sea Mate II was one of a few watches that continued to be produced after 1969 - the year Hamilton was sold to what is now the Swatch Group. It was produced until 1971. Three dials where available... a white butler finished dial, a black dial and also a masonic dial. The case is 10k rolled gold plate, RGP, with a stainless steel back. It opens through the crystal so it has a two-piece stem. I have found that these one-piece cases with a gold bezel and stainless back must be confusing to a lot of people - as it's not unusual to see pry-marks on the back where someone has tried to separate the two sections. Inside is a Swiss-made Hamilton 688 movement... the same as an ETA 2390 with 17 jewels. I recently picked up a Sea Mate II project watch. After an overhaul, dial cleaning, new crystal and a strap - I think it turned out fantastic. 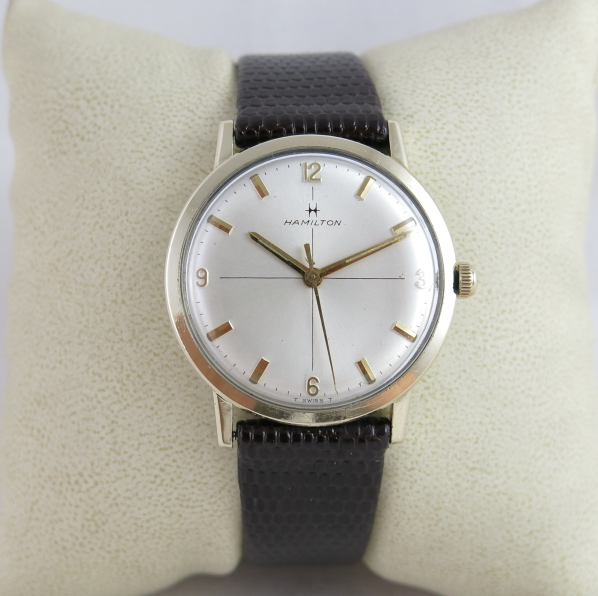 How much would you say this watch is worth? All fixed up and in serviced condition probably $200, in my opinion. A black dialed version, probably more. I was trying to identify an old watch that I have and Hamilton told me what it was and sent me to your site. Great information.